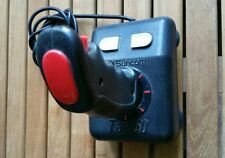 Home » Forum » MSX Talk » General discussion » 212px ? Just wondering about msx2 vert screen resolution. msx1 had a common 192px also used on other system. another common was 200px. but 212px? where does this strange number come from ? someone know a tech or non tech reason that got this strange resolution? or may guess something? 204px is the vertical resolution for CAPTAIN videotex systems. The additional 8px are for a status line. And the first appearance of the Videotex vertical resolution on MSX is with the Sanyo MPC-X Graphic Expander Unit: https://www.msx.org/wiki/Sanyo_MPC-X. In MSX2, we have two possibilities. Using R # 9, which has a copy in # FFE8. If bit 7 is at 1 we have 212 vertical points, and if it is at 0 it will be 192 vertical points. In the case of 212 vertical points, it is clear that using 16x16 tiles, there are 4 free lines below. You have an example of use of these 4 lines in Mr. Balloon. It is the immunity indicator, which is activated with the star.